"The NES is definitely one of the most popular consoles to mod. 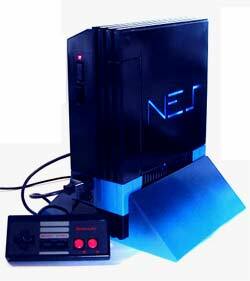 Over the last year we've seen a number of things like an NES turned into a PC, and NES DVD player, and much more. However kotami, one of France's (if not one of the world's) premier console hackers has put together one of my favorite NES mods so far. This time around he took a standard Nintendo Entertainment System, painted it completely black, added some blue LEDs to accent the PS2-styled logo, and set it on a vertical stand." Very nice. I wish my sister didn't steal my NES!! !